Kindergartners/First Graders Celebrate Thanksgiving At EPS! 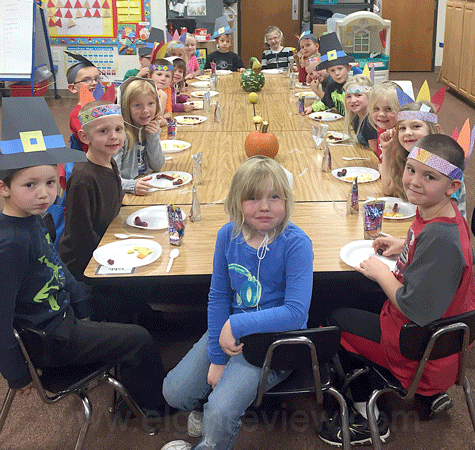 The kindergarten and 1st grade classes at Elgin Public School celebrated the first Thanksgiving by putting on a little play and had a mini feast. The characters in the play were the Pilgrims and the Wampanoag Indians. For the feast, each class got to pick four snacks they wanted for the celebration. Some of the ingredients for a wonderful snack feast were: turkey sticks, popcorn, cheezits, grapes, cheese sticks, dried cranberries, pumpkin chocolate chip cupcakes, and pumpkin pie. Happy Thanksgiving everyone!